Coastal Northern California — the “North Coast” region — was the final area to be included in the Department of Fish and Game’s statewide network of Marine Protected Areas (MPAs), effective Dec. 19. The California Fish and Game Commission adopted the new North Coast regulations back in June. This regional network includes 19 MPAs, one State Marine Recreational Management Area and seven special closures, covering approximately 137 square miles of state waters and 13 percent of the region. The commission’s 3-0 vote of approval for the North Coast MPAs completed the network of MPAs in California’s open coastal waters, from Mexico to the Oregon state line. The network of MPAs is the first in the United States to be designed from the ground up as a so-called “science-based” network, rather than a patchwork of independent protected areas without specific goals and objectives. However, many sport anglers have spoken out against the way the MPAs were established, claiming their input in stakeholder meetings was ignored or minimized, and that imposition of no-take zones was not always based on science. The Fish and Game Commission has rejected those claims, and said anglers’ input was an important part of in the process. The network of MPA is distributed along California’s 5,285 square miles of open coast state waters, totaling 119 MPAs, five recreational management areas and 15 special closures covering approximately 16 percent of all coastal state waters. Approximately half of California’s new or modified MPAs are multiple use areas, with the remaining in no-take areas. The MPAs were developed to be consistent with California’s landmark Marine Life Protection Act, the first statutory mandate of its kind in the nation, requiring that California’s MPAs be redesigned based on the best available science, with identified goals and objectives, with the advice and input of stakeholders and experts to create a statewide network. 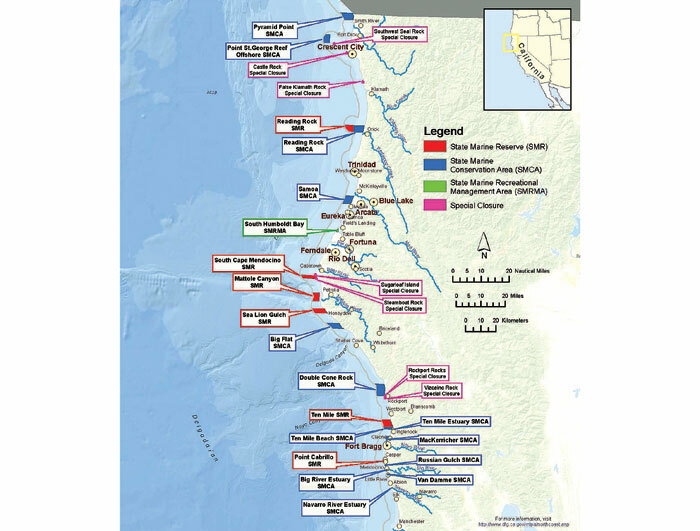 The recently established North Coast region covers approximately 1,027 square miles of state waters from the California/Oregon state line south to Alder Creek near Point Arena in Mendocino County. The Department of Fish and Wildlife (DFW) has released a guide to the Northern California MPAs which includes maps with identifiable landmarks, shoreline boundary images and existing regulations for MPAs along the northern California coast. The guide is available for online viewing and printing at dfg.ca.gov/mlpa/guidebooks.asp. For more information on California’s MPA network, including the Northern California coast, visit dfg.ca.gov/mlpa.